The CellML model presented here represents the first "core" model from the published paper which describes the basic dynamics of GnRH-receptor binding in the pituitary and the subsequent release of LH. The model includes two different possible mechanisms to account for the observed disruption of the GnRH-LH relationship in the presence of continuous GnRH exposure: 1) a desensitised receptor, and 2) a limited, yet replenishable, pool of releasable LH. The CellML model runs in COR and OpenCell to replicate the published results. The units have been checked and they are consistent. ABSTRACT: We model the effect of gonadotropin-releasing hormone (GnRH) on the production of luteinizing hormone (LH) by the ovine pituitary. GnRH, released by the hypothalamus, stimulates the secretion of LH from the pituitary. If stimulus pulses are regular, LH response will follow a similar pattern. However, during application of GnRH at high frequencies or concentrations or with continuous application, the pituitary delivers a decreased release of LH (termed desensitization). The proposed mathematical model consists of a system of nonlinear differential equations and incorporates two possible mechanisms to account for this observed behavior: desensitized receptor and limited, available LH. Desensitization was provoked experimentally in vitro by using ovine pituitary cells in a perifusion system. The model was fit to resulting experimental data by using maximum-likelihood estimation. Consideration of smaller models revealed that the desensitized receptor is significant. Limited, available LH was significant in three of four chambers. Throughout, the proposed model was in excellent agreement with experimental data. Schematic diagram of the components and reactions involved in the first model of luteinizing hormone (LH) release. 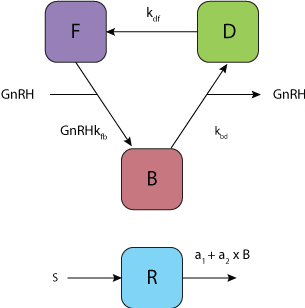 kfb, kdf, and kbd are kinetic constants, F, B, and D represent the free, bound, and desensitised states of the gonadotropin-releasing hormone (GnRH) receptor, while R represents releasable LH and B is bound LH. s is the rate of the reaction, a1 determines the rate of basal LH secretion and a2 is the rate of LH secretion in the presence of bound receptor. Derived from workspace Heinze, Keener, Midgley, 1998 at changeset d7ff63605bdb.